Back in Havana, we were exhausted and feeling like our almost three-week trip could most definitely have been done in two. But we arrived back in Havana earlier than our flight date as we had unfinished business: we’d been so eager to get on our travels that there were quite a few things left to do. One such thing was a tour in an old-fashioned American car. During leg two of Havana, we ventured down to the Malecón pier and haggled with the driver of the first car we saw, a beautiful red convertible (don’t ask me the manufacturer, I’m rubbish with cars!) who gave us a tour of some of the places we hadn’t really concentrated on during our first part of the trip. This trip usually costs CUC 40, but we knocked him down to about CUC 30*. John Lennon. Where are his glasses? It started with a rather blustery and wet trip down the rest of the Malecón as the waves crashed up and over the pier – watch out for your camera! 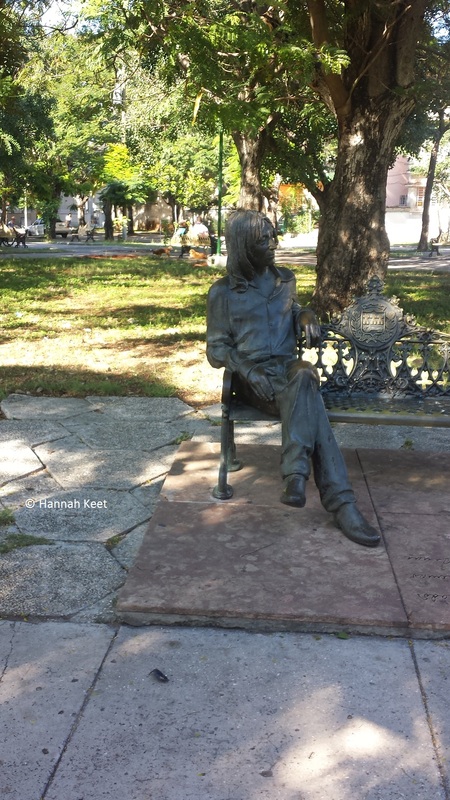 – turning into the more modern district of Vedado, stopping at Plaza de la Revolución so that we could gawp and take pictures of the Che and Cienfuegos memorials, then onto Parque Lennon, where there’s a statue of John Lennon without his infamous glasses sat on a bench. Apparently the glasses kept getting stolen, so don’t be alarmed to see an old man hobble up out of the blue to put glasses on him (and hang around awkwardly as if expecting money), as we did. 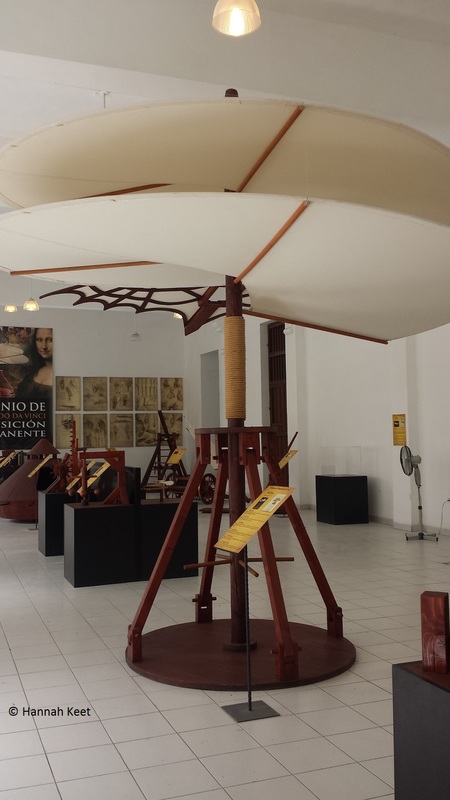 Another worthwhile tour is the Havana Club tour in El Museo del Ron. You get taken around the Havana Club building in groups according to your language (English, German, and Spanish tours are available) and get shown the history of rum-making for CUC 7. Our tour guide was animated, funny, and a little bit nuts, which made the tour stand out a little bit more. Once you’ve completed the tour, you get a shot of rum included in the price, then shown to the gift shop. Check out the wildly over-priced bottle of Maximo Extra Anejo rum in the centre of the shop, I dare your mouth not to hit the floor on reading the price tag. One night, nearing the end of the holiday when we thought we’d seen all we had to see, we were at dinner and met a fellow tourist who seemed to have packed in loads of random things into the short space of time that he’d been here. He recommended the Camera Obscura – a lens with 360⁰ real-time views of the city and a really humorous guide who explains the ins and outs of it in English and Spanish – and El Genio di Leonardo da Vinci – a museum dedicated to da Vinci’s drawings with a room packed full of wooden scale models of his imaginings. Both of these were fabulous and I would wholeheartedly recommend you take a look if you’re ever in Havana. I have to say, it was so good to see our original casa owner Leonil again. We stayed with him for the remainder of our trip and had a rather drunken evening full of rum, talking politics and putting the world to rights in Spanglish on the last night of our trip. He also acted like our Cuban granddad, helping out when we had hundreds of CUCs to change back into pounds, but no bank or cadeca that we tried in the city would take them. He marched us down to his local bank, where he knew a guy, but unfortunately they couldn’t help us either. (It turns out it’s pretty easy to switch money back at the airport). Needless to say I was pretty emotional when the rust bucket of a taxi pulled up outside the casa and can’t wait to get back to Cuba in the not-so-distant future to see how it changes. This will be one holiday I’ll never forget!